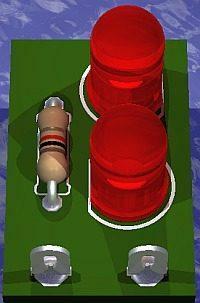 The proposal of that circuit is to help to find the burned fuse with more easiness and speed. How does the circuit of test of car fuse work? That circuit is based on circuit of test of burned fuse in the feeding stage. With a fuse in good state the potential difference between a terminal and another is null (0). Fuse is burned, a potential difference exists among a terminal and other, because the circuit is open. 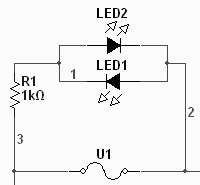 The circuit is composed of two leds placed in parallel and felt opposite, the circuit doesn’t have like this polarity. The leds are protected by the resistor of 1 kohms. To use the circuit it sets up him/it in a mini circuit plate printed or just weld the components in agreement with the Schematic. As proof tip you can use two piece of threads of about 10 cm, do an I chamfer in their tip leaving them as the tip of proof of your multimeter. As the mounted circuit is only to lean the tips in the terminals of the fuse to be tested without removing the fuse of the door fuse. Preferably with the linked key so that the circuit of the automobile is energized. If one of the leds led lights it indicates open fuse. Not to ignite, possibly the fuse is ok. Since the area of maintenance of TVs and domestic equipments are in drop, the area of electronics automotive is a good exit for technicians in electronics. As we can see R it is the resistance of the circuit of the automobile (lamp, honks, etc.) that is in series with the fuse, B is the battery of the automobile and R1 it is the resistor that protects the leds. With the open fuse, it is as if the fuse didn’t exist, the current will go by the led. In that situation the current will go by the fuse that has resistance same to zero, instead of raisin for the leds.